Chuck and I returned yesterday from being on retreat for the weekend with a group of distinguished writers who meet once a year at Laity Lodge in Texas. Chuck contributed music — a wonderful concert on Sunday night — and I was privileged to be a fly on the wall, soaking up words and stories from a community of people I admire and from whom I have learned so much. There are younger writers in the group, but most who made it to the retreat had gray hair and aging frames — writers with a long history of publishing poetry, novels, essays, memoir, spiritual writing, and theology with a literary touch. Some of the writers were new to me, and they are a glad discovery, but others have written some of the most underlined and important books in our library. As I listened in at the gatherings and had conversations over meals, I found that no one has a perfect writing life. Some are university professors who write in the summertime and find it hard to remember what they were writing about after nine months of teaching. They long for sabbaticals. Some have a patchwork of other jobs and keep their deadlines by writing at night, on the weekends, and in waiting rooms. Others are dealing with sorrow, failing bodies, and the changing world of publishing. It’s good for me to hear these things from people who’ve been at it for a long time, who continue to write regardless of the challenges they face. Through their faithfulness to the vocation of translating experience into words, imagination into story, and scholarship into beautiful writing, the world is blessed and my life is enriched. Earlier this month we began a new season in our household. On January 2nd I pulled a chair up to the fireplace, prayed for my daughter and son-in-law on their 13th anniversary, opened my laptop, and felt eager for life and grateful for change. After 30 years of operating a radically open home, particularly for the 20 years of our Art House life in Nashville, Chuck and I are transitioning from a constantly revolving door to a more private household. Hospitality will still be a part of our life, but not an everyday labor. We’re drawing some strong boundaries in order to make room for other aspects of our life and work to flourish. In the past year, I’ve become a writer who doesn’t write. I started five articles over the course of last year but couldn’t stay in the writer’s seat consistently enough to develop and complete any of them. Something else always took precedence. We had drop-in visitors and meetings on a regular basis, house guests for most of the year, work travel, West Coast family responsibilities, Art House events, and much more. All of this was good and essential to our life. 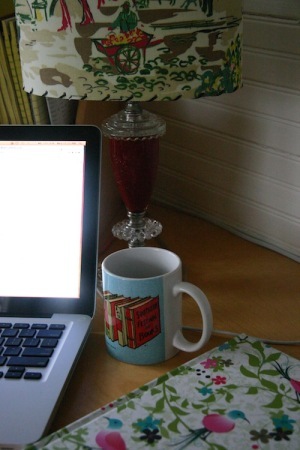 Even so, with 2012 underway, I’m setting my compass in the direction of a writing life, and with the help of my husband, doing all I can to bring it front and center. Rearranging time, habits, and expectations is easier said than done. People’s needs and requests can speak louder than the quiet beckoning of an unfinished page. What’s more, people-care sparks my imagination in a unique way. I love creating in this arena and I don’t want to give up responding to need or imagining for the good of those I’m meant to love. But there is a dilemma: how to live as a responsible and imaginative caregiver and also get other creative work done. This is an old and common struggle — particularly for women, especially for those raising children. It also affects the newer version of men who are deeply involved in the day-to-day care of life in their households. If it seems like growing older should naturally take care of some of the tension, there’s no guarantee it will. Aging only complicates the issue. In families, once children grow up, relational responsibilities become even more complex. People tend to multiply, adding children-in-law and their families, grandchildren, nieces and nephew’s spouses and children, along with the possibility of families being spread geographically. And with friendships, the longer you live, the more people you know. There is always a worthy human need or want beckoning. Last October I went to the Southern Festival of Books and heard best-selling author Ann Patchett speak. With good humor, she shared about the difficulty of getting work done during a year when she had overnight guests for roughly 250 days. I don’t know her, but I felt an immediate kinship. When I thought about it later, I wondered how in the world she ever got to her writing with that many people around. I couldn’t find it in my notes, but I thought I remembered her mentioning a hotel. Looking for clues, I found an article Ann wrote for the October 16, 2010, issue of The Wall Street Journal titled “Did I Kill Gourmet Magazine?” In the article she spoke of her years as a travel writer for Gourmet and the kindness they constantly showed her. She writes “And when I had a particularly endless stretch of house guests, I told Sertl [Bill Sertl, her editor at the magazine] I would like to check into a very fine hotel alone and not leave the premises for a week.” I don’t know if she was referencing the same timeframe as when I heard her speak, but the issue is the same. All writers, including famous ones, have a unique life to navigate. The call to people and the call to writing are not mutually exclusive. For most of us, they co-exist in some form and we have to find our way through, adjusting as we go. Sitting with an open laptop or a legal pad and laboring over words and sentences requires solid blocks of time: hours, days, weeks, and years. Some writers use outlines, organizing the flow of their thoughts before beginning to write. I’m more apt to launch right in and find out what I’m writing about by writing. I do have a file on my Mac titled “Andi’s Writing Ideas,” which my good friend Jenny White helped me create. It’s a grid-like chart where I keep my thoughts in one place: ideas and topics, detailed notes, and the outlet they might be used for — whether essay, book, or talk. It’s wonderfully helpful, and when I’ve had a year like the one that just passed, it provides reassurance that I do have things to say and a pool of ideas to draw from. I need this reminder. For the whole of my life I’ve read one book after another, especially in the hour or so before turning the lights out at night. Even during the long years of my seminary studies when I read stacks of theology books during the day, I still read at night, but the books were different. They were stories. I needed the pure enjoyment of fiction and memoir, and the good food of literary writing. In the last few years, however, I’ve developed a different bedtime habit: watching television downloads or DVDs on my laptop. This is not a bad thing in itself. Television writing has never been better. Though for the sake of honesty, I must admit I’ve gotten out of control. If I told you how many times I’ve watched all seven seasons of The Gilmore Girls, you’d think me a bit loopy and you’d be right! Even worse, over time it means I’m reading fewer books. That’s not good for anyone, but it’s particularly negative for writers of any stripe, from songwriters to novelists. Reading and writing are companions. The pleasure of words and stories taken in nourishes the writing that goes out. 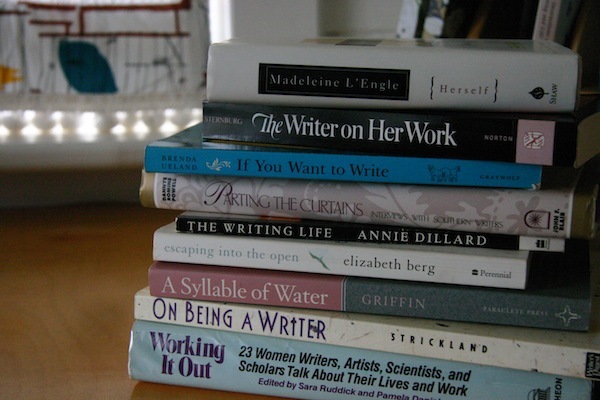 Several of our bookshelves are filled with books about writers and writing. Anne Lamott’s Bird by Bird, Donald Hall’s Life Work, Annie Dillard’s The Writing Life, and The Writer on Her Work edited by Janet Sternburg — to name a few — are instructive, insightful, and inspiring. As with any vocation, it helps to hear from others who do what you do or what you dream of doing. I spend a lot of time around musicians and songwriters whose creative work takes years of disciplined labor, but is often done communally. Writing essays and books, on the other hand, is solitary work. Reading about other people’s writing lives helps me stay focused. So I’m particularly interested in hearing from women writers. I know there are exceptions, but no matter how much society changes, women are still the most likely ones in a family to juggle caregiving, cooking, household maintenance, and writing. I want to know their stories. In a book published in 1994, Parting the Curtains: Interviews with Southern Writers, Doris Betts was asked, “What would be your ideal writing day?” She answered, “I really have never had one. . . . Well, I was going to say it would begin with everybody waiting on me instead of the other way around.” Kaye Gibbons answered the question “Do you usually write every day?” in this way: “Usually I write every day while Mary naps.” These very human answers are a good reminder that few people write in an ivory tower environment. Those who create a body of work over a lifetime keep coming back to the writer’s desk regardless of the obstacles. They write because it’s who they are. Andi is the author of Real Love for Real Life: The Art and Work of Caring. She lives in Nashville, Tennessee, holds a Master of Arts in Theological Studies, and is grandmother to five grandchildren. Her current television faves are Parenthood, Downton Abbey, and Modern Family. Andi Ashworth is the author of Real Love for Real Life: The Art and Work of Caring. She and her husband, Charlie Peacock, are Co-founders/Directors Emeritus of Art House America, with Art House branches in Nashville, Dallas, and St. Paul. Andi also serves as editor-in-chief of the Art House America Blog and holds a Master of Arts in Theological Studies. She loves reading, writing, gardening, family gatherings, walks, and adventures with her husband.